If you would have told me a couple of years ago that my favourite lasagna would be one that’s both cheese AND noodle free (at least not dairy based cheese but we’ll get to that later on) I would have told you to take a hike for declaring such blasphemy. And yet here I am. I’m going to chalk this up to another Whole30 success. 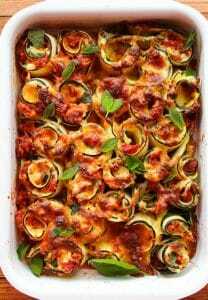 Though I’m not sure that the idea of lasagna is exactly Whole30 approved – I’m just going to run with it. Rules are meant for breaking. Sometimes you just need a hot and cozy meal full of nostalgia and love. After all, that is what food should be at its best, ya know? 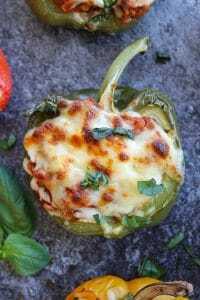 So while I’m not 100% on whether on not cheesy casseroles like this are supposed to be recreated on the Whole30 diet (I’ve never read the book), this is an entirely Whole30 compliant dish. 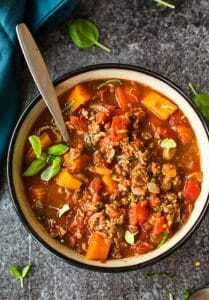 There are none of the usual suspects here as far as dairy, grains, & sugars go – just meat, sauce, and veggies! Making this lasagna can be broken up into three parts: the meat sauce, the almond ricotta, and the basil pesto. It might look intimidating at first glance but it’s really not too hard when you break it down – just the right amount of work. 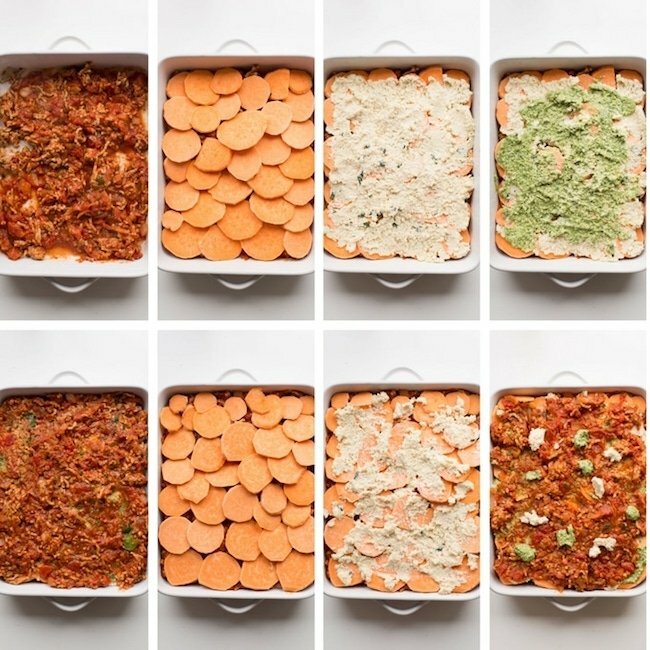 Making lasagna, paleo or not, is for people who love cooking and love eating. So just put on some music or maybe a good podcast and get to cooking! The Meat Sauce: Nothing too fancy or out of the ordinary of your usual lasagna. Start out by quickly sautéing your onions in garlic along with your mince. Once browned begin adding the spices along with the tomatoes, stock and vinegar. Let simmer on the stove top for about 25-30 minutes to deepen the flavours and thicken in consistency. While the meat sauce is simmering begin prepping the ricotta and basil. Almond Ricotta: This is hands down the easiest part – just add all the ricotta ingredients to a blender and blitz. Some blenders may need a little more time to get the right consistency, but no more than a couple of minutes. You’re looking for a whipped, creamy texture that’s almost completely smooth with little bits of almond chunks left. When done, transfer the nut ricotta separate bowl and clean out the blender for the pesto. Basil Pesto: Similar to the almond ricotta, simply add your ingredients to a blender and process until smooth. Easy! Both the ricotta and the pesto do call for nutritional yeast here. If you’re not familiar with what nutritional yeast is – it’s an inactive yeast that’s got a nutty, cheesy flavour. It’s also rich in B12 vitamins which can be a tricky nutrient to get in dairy & meat free diet. I often use it as a parmesan substitute in cooking which is why it’s used here. If you can have yeast feel free to swap it out with real parmesan or your favourite parm substitute. You can also just leave it out altogether. 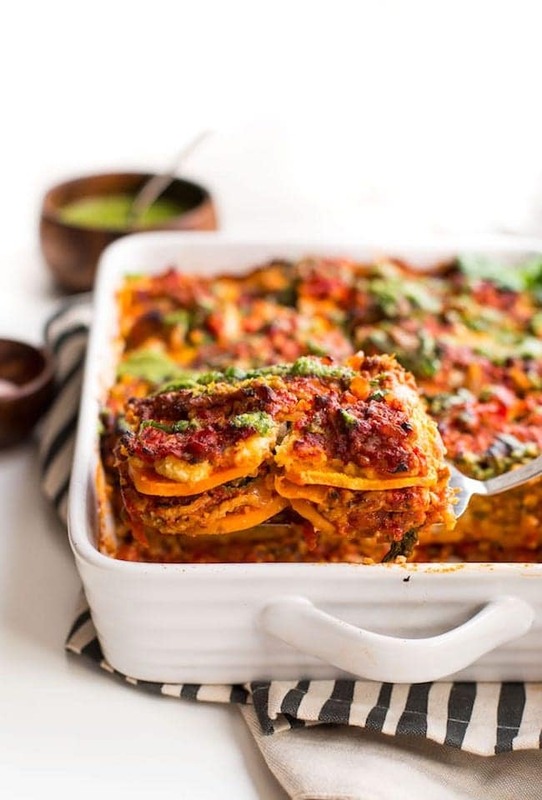 I do think it adds a lot here, but even with it this sweet potato lasagna has so many great flavours. And last but not least – the sweet potatoes! If you’ve got a handy-dandy Mandoline Slicer this will take you no time at all. If you don’t have a mandoline – no worries! Just slice the sweet potato into thin slices (about 1/8 inch think) and you’re good to go! So what do you think? 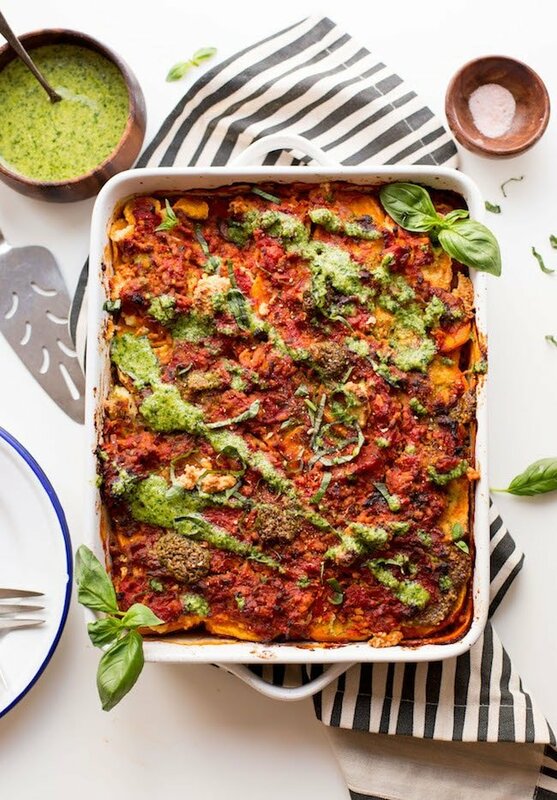 Please tell me I’ve convinced you because I want everyone to make and try this sweet potato lasagna! 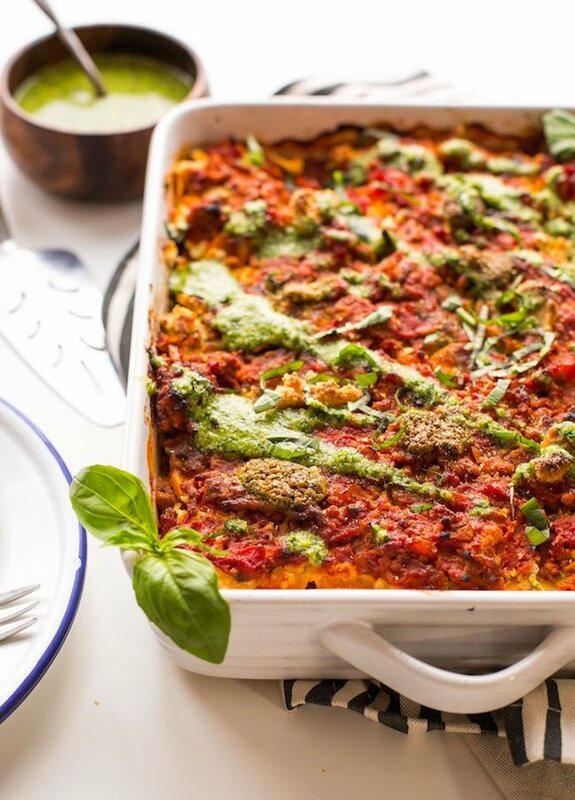 Don’t forget to #asaucykitchen on instagram if you try these Paleo Sweet Potato Lasagna! I’d love to see what you make with it! You can also post your pictures to my facebook page! Warm the olive oil in a large skillet or pan over a medium heat. When the oil is hot add the onions, garlic and mince and cook. When the meat is browned stir in the fennel, basil and parsley. Add the crushed tomatoes, paste, stock (or water) and vinegar. Taste and season with salt and pepper. Bring the sauce to a boil and then reduce down and let simmer for 25-30 minutes, stirring occasionally to thicken the sauce. Preheat the oven 375°F/190°C and lightly grease a 9x13 inch casserole dish. Peel your sweet potatoes and then slice into thin rounds using either a sharp knife or a mandolin. The slices should be fairly thin, about 1/8 inch thick. Add all of the ricotta ingredients to a high-powered blender and process until whipped and almond entirely smooth. There should still be a few almond chunks and the mixture should resemble dairy ricotta. Taste and season with a little extra salt if needed. Transfer the ricotta to another bowl and clean out the blender to make the pesto. Add all of the pesto ingredients to the blender and blitz until smooth. Taste and season with more salt if needed. Add a tablespoon or two of water to thin out the consistency if desired. Spoon out about 1/3 of the meat sauce over the bottom of the casserole dish. Top with a layer of sweet potato slices, overlapping only slightly (use half the potato slices). Carefully spread 1/2 of the almond ricotta over the sweet potato and then 1/2 of the basil over the ricotta. Top with the second third of the meat sauce followed by the rest of the sweet potatoes and then the remaining ricotta. Finally top with the rest of the meat sauce. If you have any remaining bits of ricotta you can dollop it over the top of the sauce along with a few dollops of pesto. Make sure to save most of the remaining pesto to drizzle over the top at the end. Place on the middle rack in the middle of the oven and bake for 30-40 minutes until the sweet potatoes are fork tender. Drizzle the remaining pesto over the top, let cool for about 10 minutes before slicing and serving and enjoy! Hi! I love this recipe, and am planning on making it for this week’s dinner one night. Any suggestions on prepping it early, freezing it, then heating it up on the night we want it? Thanks in advance!! Hi Cam! So I haven’t tried freezing this yet but I don’t think that would be a problem at all. If I were doing it I’d cook the lasagna as is and then let it cool completely before wrapping well in plastic wrap and foil. I think you should be able to reheat from frozen. When you’re ready you’ll need to cover with foil so the top doesn’t burn and pop it in an oven preheated to 375°F/190°C for about 50-60 minutes. You might need to rotate the dish around to heat evenly. If you have a cooking thermometer check to see if the internal temp is 165°F. You should also be able to defrost over night in the fridge and then reheat in a similar amount of time. I can’t have beef, can I use chicken or vegetable stock? 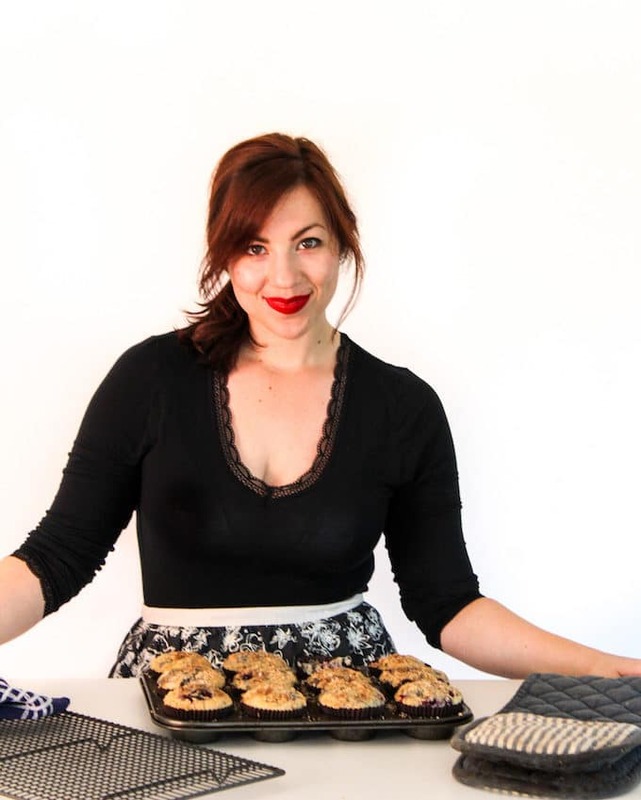 I found your website and can’t wait to make some recipes. They sound yummy. I made this tonight and it was delicious! Thank you for the great recipe. I did buy a local vegan pesto sauce instead since fresh basil was too expensive this time of year. I’ll definitely make it again. I might try adding chopped spinach too.